This trip has been on my to-do-list ever since I visited Indonesia last year and didn’t have enough time to do it. I’ve heard many stories, and our expectations were high! On the 16th of November, we embarked on the boat trip from Bangsai harbour with 21 other travellers, and a four men crew. The first stop was Sugian bay, for a refreshing swim before starting the 16-hour overnight journey to Mojo island. As it happened to be, our first night on the boat was the night that the “super moon” raised to the sky. We watched the moon emerge from the sea in front of us, while at the same time a thunderstorm took place a few kilometres on the left, and dolphins were catching breath on the right. A beautiful sight from the deck of the boat! The following morning we woke up at 05:30 after a pretty good sleep, considering we were all crammed on the deck on tiny mattresses. We started the day with a banana pancake and an early morning swim. The boat took us to the beach of Mojo island. 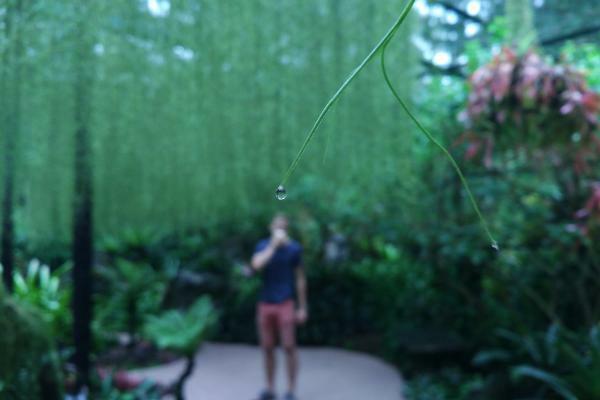 After swimming, we took a little hike through the jungle to an unusual waterfall. 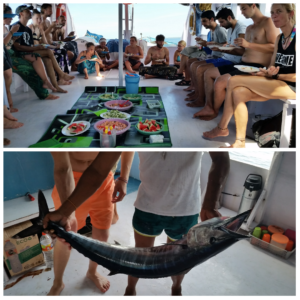 On our way to the next stop, a “world class diving spot” where we saw a wide range of beautiful fish and coral, we caught a big Marlin. The crew on the boat knew exactly what to do, and later that night we were all feasting on this delicious fish. As we sailed further east of Indonesia, towards East Nusa Tenggara, we noticed a significant change in landscape. The lush green mountains are interchanged by dry, desert looking hills. Early in the morning we hiked up one of these hills, to watch the sun rise over the Flores sea. Back on the boat, we were all very excited about the next stop: Manta Point. It is here, if you are lucky enough, where you can see and possibly even swim with manta rays. Three quarters of an hour along the coast, the boat suddenly slowed down, and one of the crew members started yelling: “Manta’s! JUMP JUMP JUMP!”. Without thinking, Radek and I jumped of the boat with our snorkelling gear. As the bubbles from our jump into the water were fading, the first manta ray, with a width of about 3 meters, appeared right in front of us. It seemed as if everything stopped for a moment when this magical creature of the ocean was flying around us. Then we noticed another one underneath us, and one on the side, and another one! I came back to the surface to find that our boat sailed a bit further and we were quite far away from the group. Back underwater there were even more manta rays. Even though we knew these peculiar fish primarily eat plankton, it was still quite scary to find ourselves among seven 3-4-meter-long manta rays with their enormous mouths. Our fascination with these angelic creatures even distracted our attention from the jellyfish that were stinging our skin. Pink beach was the next stop for some more snorkelling. This beach earned its name thanks to the fact that the sand appears to be pink from a distance. We ended this great day in a traditional fishing village, to see how the fishermen live, and played some football with the kids. 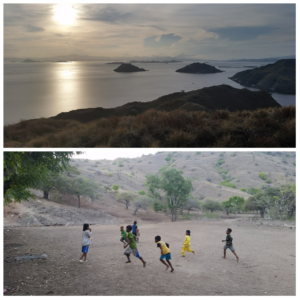 On our final day of the boat trip, we got to the activity that this trip was most advertised for: Komodo National Park. 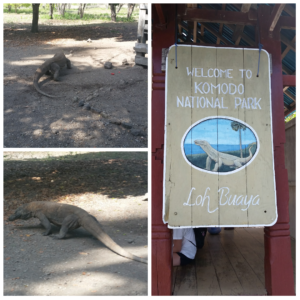 Established in 1980, the main purpose of the Park is to conserve the unique Komodo dragon and its habitat. As we walked around the island we noticed a few of these imposing lizards hiding in the shadows of trees and houses. 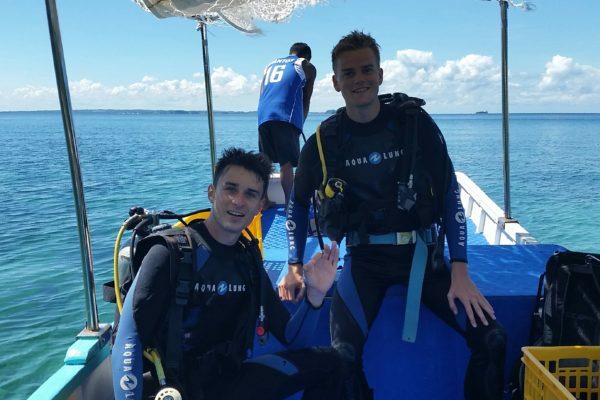 Although a memorable sight, the experience certainly didn’t top swimming with the manta rays. In the afternoon, we arrived in Labuan Bajo. Once a small fishing village located at the western end of Flores in the Nusa Tenggara region, the city has grown into a scuba diving hotspot. 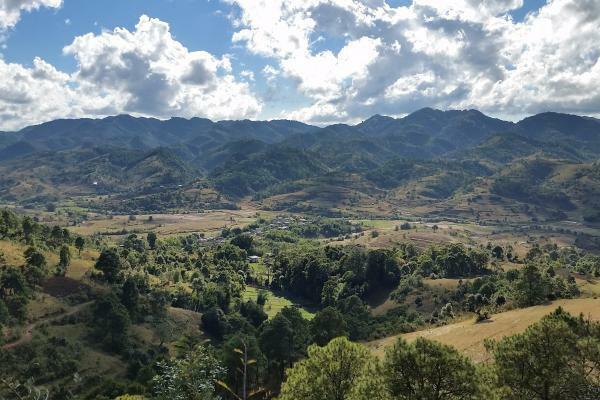 As you get outside of the densely populated area, you behold small farming villages and beautiful nature. 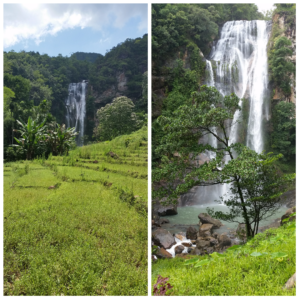 An example of its largely undiscovered beauty is Cunca Rami, a waterfall located about an hour scooter ride from Labuan Bajo. We rode through a small village, when a local offered to guide to the spot. At first we thought we didn’t need a guide, but we soon realised we were lucky to accept his offer. With a machete dangling by his waist, he led the way through the jungle and rice paddies, and about an hour later we arrived at a stunning waterfall! Book a boat journey from a travel office on one of the Gili islands or Lombok. For a 4-day 4-night journey we paid 1.6M IDR, including the entrance to Komodo National Park and all other fees. The portions of food on the boat were OK, but take some more fruits or snacks with you to complement the diet. Everyone gets 5 bottles of water for the trip. We took a bit more just to be sure we didn’t get thirsty. The last night you may sleep free of charge on the boat in Labuan Bajo, instead of finding a ho(s)tel. FYI, There is no shower on the boat. In Labuan Bajo we stayed in a cheap private room w/o AC at 150k IDR next to Mediterraneo restaurant. Prices of other hotels, start at 350k/double room. Renting a scooter is about 70k per day. The waterfall Cunca Rami is worth a visit! We paid a guide 50k + 20k tip. Labuan Bajo boasts a modern airport and affordable flights to Denpasar (Bali), as well as other locations on a daily schedule.